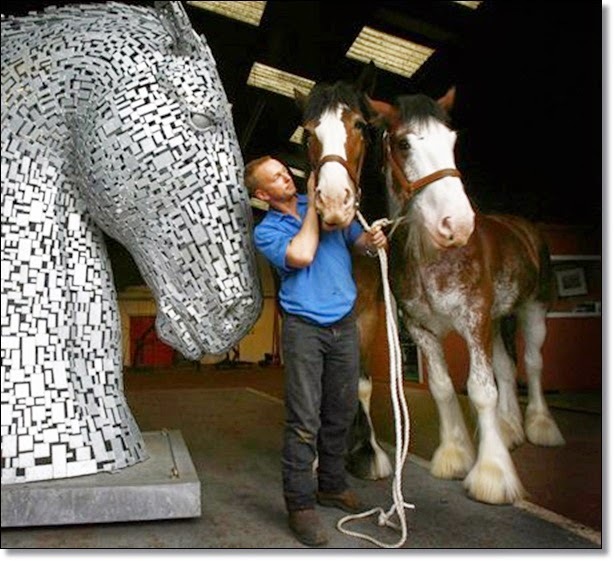 “The Kelpies” is an enormous installation consisting of two giant horse head sculptures by artist Andy Scott. The 100-foot-tall structures, which were eight years in the making, are inspired by a legend from the artist’s Scottish background that tells of a water spirit that takes the shape of a horse. More than just a pair of broncos to Scott, the sculptures serve as monuments of the artist’s national pride. Against the backdrop of a moody Scottish dusk, these towering steel horse heads loom 30 metres tall, aglow with shifting colours. The 300-tonne statues, called The Kelpies,( watch over the entrance to the ocean, where the Forth and Clyde canal meets the North Sea in Falkirk. 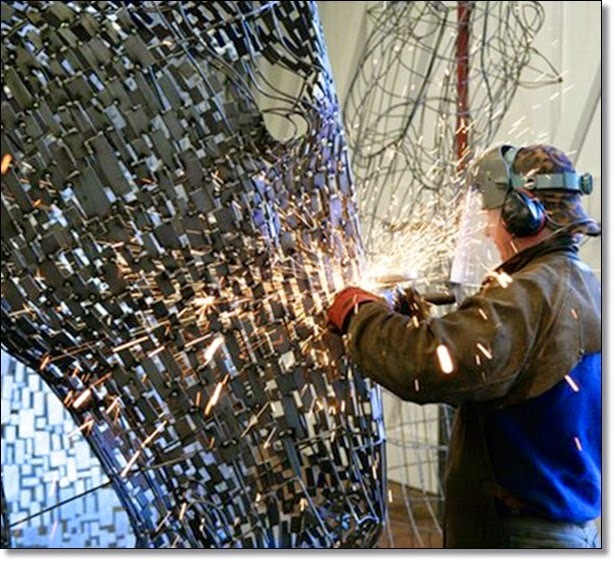 Their patterned skin, made of stainless steel, is held aloft by an intricate steel framework. At night the two statues glow in unison as the glow of upward-pointing spotlights spills out round the gaps in their surface. They borrow their names from mythological horses which haunt lochs and rivers in Celtic legend. 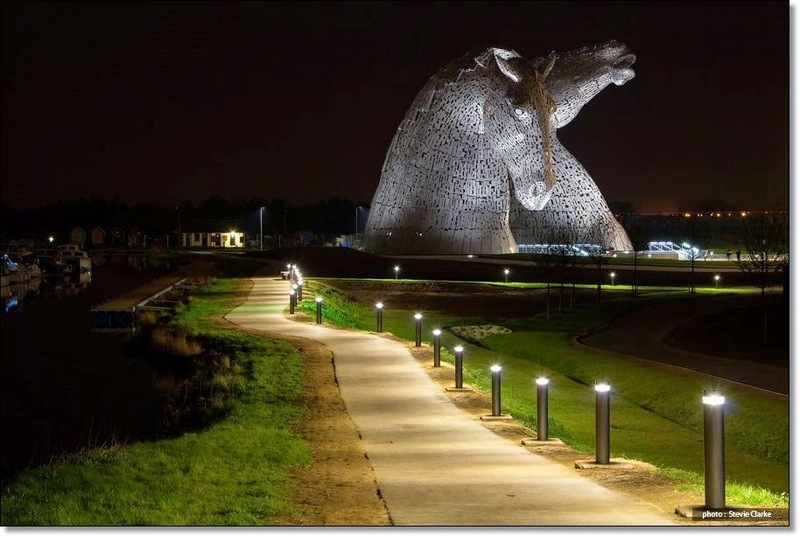 Kelpies were said to be able to transform into beautiful women to ensnare travellers. 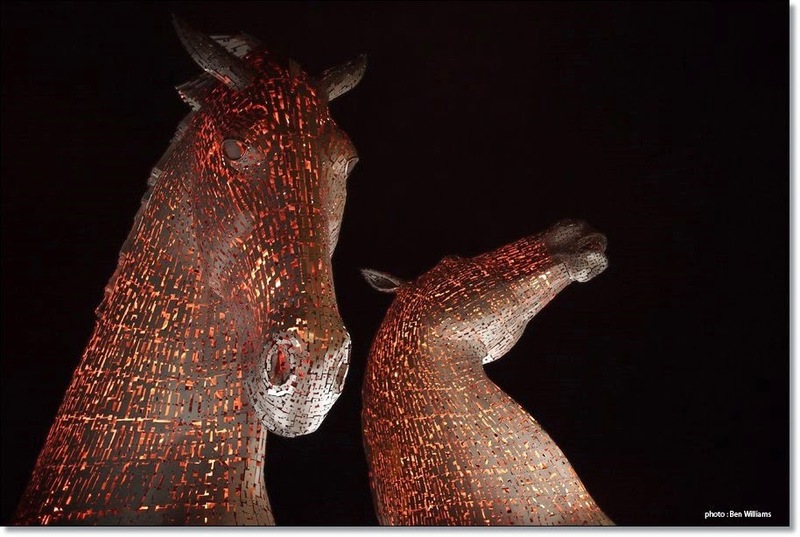 The massive sculptures, designed by Glaswegian Andy Scott, pay tribute to the working horses which once fired Scotland's economic prosperity by dragging industrial barges along the extensive network of canals. Using a unique hyperlapse technique, this video features footage captured within a live construction site. Filming under these conditions is rarely possible; filming under these conditions using the hyperlapse technique is close to impossible. Created from over 60 days of stop-motion filming across 7 months, and tracking construction through to completion, this film uses over 12,000 individual photos, none of which have been edited or manipulated beyond settings inside the camera. Walid captured 120,000 individual images to create this seven minute masterpiece. 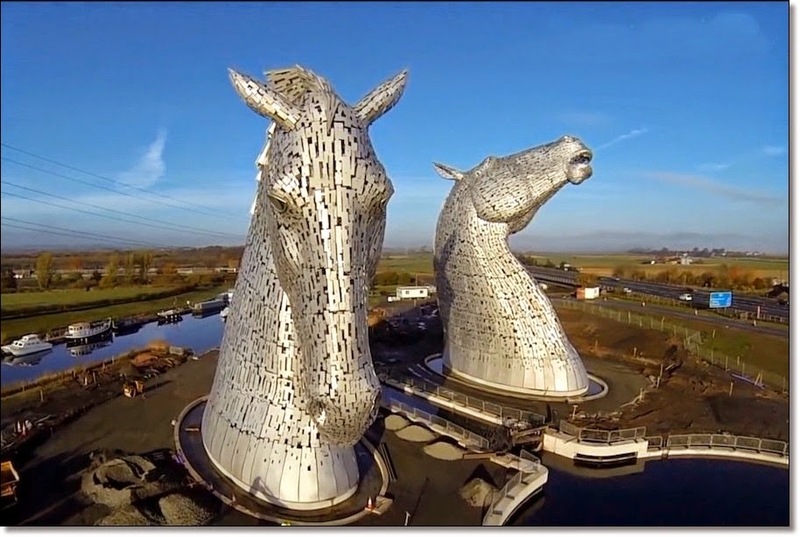 Aerial footage filmed by Alan Corrie, showing The Kelpies with the Forth & Clyde Canal and their surrounding landscape which will be completed by end of April 2014. This amazing footage shows The Kelpies from otherwise unattainable angles and gives a real sense of their scale. 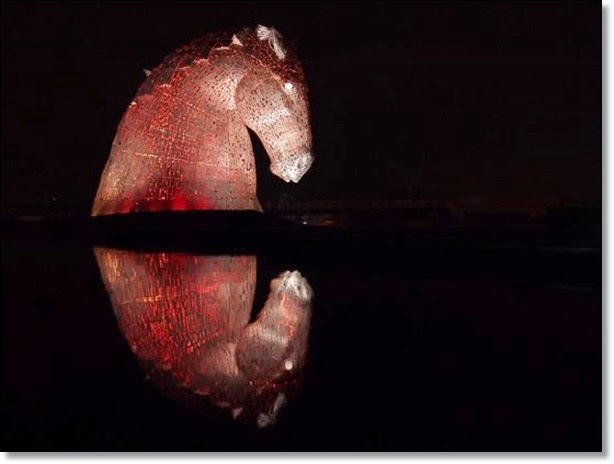 The title and theme of The Kelpies as mystical water-borne equine creatures was inherited at the outset of the project, almost eight years ago. Since then it has evolved dramatically and in the process the ethos and function has shifted from the original concept. Falkirk was my father’s home town and that inherited link to the town has been one of my driving inspirations. A sense of deep personal legacy has informed my thinking from the outset, with old family connections anchoring me to the project. As an artist I frequently tackle the theme of equine sculpture in my practice. My horse based works are always rooted in a socio-historical relevance or respond to a brief from the client. In almost every project they are related to the site, the audience, history or a combination of themes. 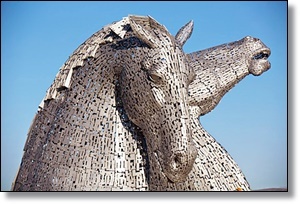 The materials of the sculptures are deliberately those of Scotland’s former industrial heartland, steel construction on an architectural scale: equitecture The towering horse heads have an industrial aesthetic with structural columns and beams visible through the riveted laser cut steel plates of the skin, the manes rendered as geometric overlapping slabs of steel. The entire structures are illuminated inside and out to create a stunning spectacle in hours of darkness. They elevate Falkirk and Grangemouth to national and international prominence and bring with them a sense of pride and ownership, having achieved global media coverage. As a canal structure they partner the iconic Falkirk Wheel, and echo its grandeur. They stand as a testament to the achievements of the past, a paean to artisanship and engineering and a declaration of intent for the future of Scotland. As with all of my works, they will doubtless create many narratives and the original Kelpie myth will inevitably resurface. The title will spark a mystical interpretation in many viewers. That is up to the beholder and of course I welcome the engagement of the widest possible audience in the sculptures. My intent however is built around a contemporary sculptural monument more than an ancient legend. 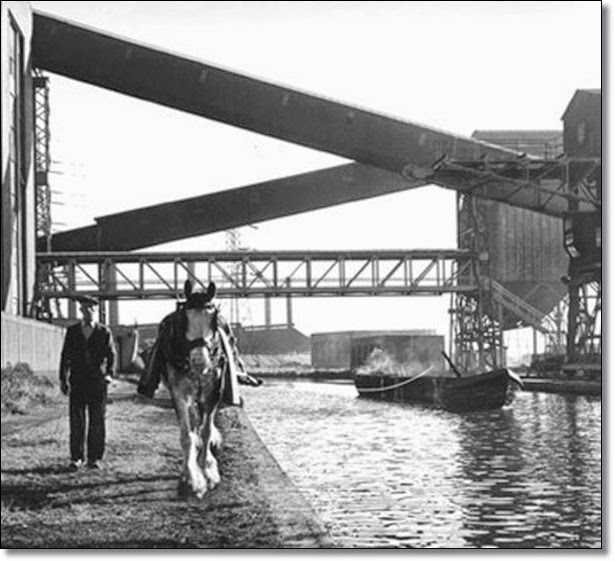 Water-borne, towering gateways into the canal system, The Helix park, and the nation, translating the legacy of the area into proud equine guardians. Andy Scott, November 2013.